A while back, I read H. Samy Alim and Geneva Smitherman‘s excellent book Articulate While Black. The book takes an in-depth look at racialized public reaction to Barack Obama especially as a candidate for president. One phenomenon they explore is the use of the word articulate to describe Obama, especially in light of a rather infamous quote by Joe Biden who has since become Obama’s vice-president but was at the time a fellow candidate for the Democratic Party’s nomination. Biden described Obama as “the first mainstream African-American who is articulate and bright and clean and a nice-looking guy”. It’s impossible to deny the racialized meaning found in Biden’s ‘compliment’ here (and it’s obviously not just articulate that is problematic). Indeed, many including Alim and Smitherman have remarked that the word is used to remark on the surprise White people feel at meeting an African American capable of communicating, stemming from racist stereotypes of African Americans as ignorant, incompetent, or incomprehensible (see also Eugene Robinson‘s and Lynette Clemetson‘s articles on the topic). A recent article at The Root by A. Gordon connects concern about the racialized nature of articulate to the recent campaign against bossy which I have written extensively on (here, here, and here). Gordon calls on people to be more aware of how words like articulate can be used as weapons against African Americans in much the same way bossy is used in a gendered fashion. Gordon’s call has reminded me of my own interest in looking at this issue using the tools of corpus linguistics spurred by my reading of Alim and Smitherman’s book. I used the newspaper, magazine, and spoken (television transcriptions) subsections of the Corpus of Contemporary American English to search for instances of the word articulate used as an adjective (as opposed to as a verb, for example “He articulated his vision very clearly”) and used to describe a person as a whole (as opposed to things like “articulate dialogue”). The instances that I analyzed had articulate used to describe a person in sentences like “She is articulate” (person + be + articulate) or “He is an articulate man” (person + be + articulate modifying noun phrase). After reading through numerous occurrences of articulate I ended up with a sample of 143 instances that fit my criteria and where I could identify the person (and their race, as determined by my own perceptions of the person’s race through looking at pictures I found through Google Images) being labelled articulate. Given the frequent claims by African Americans that the word is used to convey a sense of surprise at the linguistic abilities of Black people, I started by investigating whether the word was used disproportionately to describe people of color (POC, in which I include members of other racial minorities, not just African Americans) in my sample. Since my language data is from a time period between 1990 and today, I decided to use US Census data from 2000 (an approximate midpoint in the time span) as a baseline for what we would expect in terms of the relative distribution of people being called articulate. The 2000 US Census estimated about 75% of people living in the US at the time considered themselves to be White, and 25% were POC. 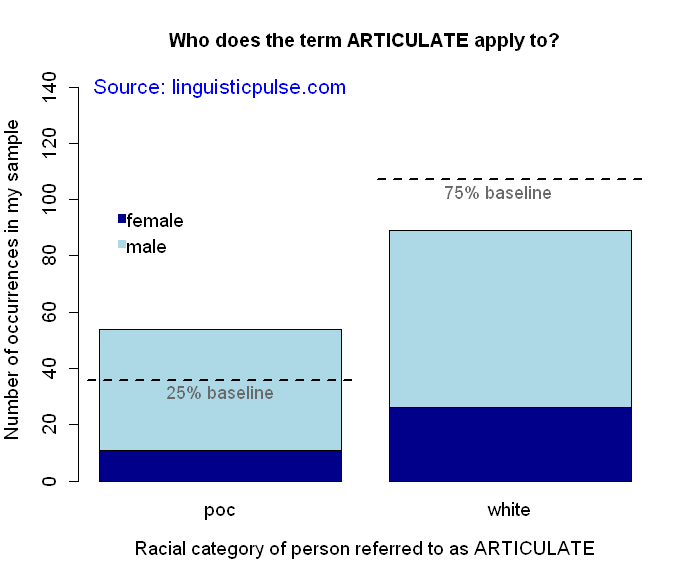 Thus, I’ll assume, for the sake of argument, that if there’s no racial bias in the use of the word articulate, then for every one POC who gets called articulate in my sample, we should see three White people being labelled with the word (of course, this glosses over the fact that POC are likely underrepresented in COCA among other complications, so this baseline should be viewed merely as an imperfect estimate). What I found is presented in the graph below. What you see in the graph is that the number of POC who were labelled articulate in the corpus is above my baseline of 25% (significantly so, chi-squared = 12.4219, p = .0004), meaning that we do see a bias in terms of POC being called articulate at a disproportionately higher rate than White people, supporting the arguments of many previous writers such as those I cited above. Those who were called articulate more than once were Herman Cain (3 times), Anita Hill (2), Barack Obama (8, with some being commentary on Biden’s quotation from above), and Condoleezza Rice (2). Interestingly, with the exception of Biden’s comments, race is rarely explicitly remarked upon, but the statistical tendency suggests it is in fact relevant to shaping perceptions of who is expected to speak in a manner we find pleasing or impressive. Nonetheless, as you can see, the bias is not terribly strong. White people are still quite frequently labelled articulate, so I decided it would be worth taking a closer look to see which White people are described using the word and what this might reveal about the word’s usage. Politicians again feature prominently among the people who are frequently called articulate, and the following White politicians were assigned the label more than once: Bill Clinton (3), Mario Cuomo (2), Newt Gingrich (6), and Sarah Palin (2). It’s worth pointing out that all four use varieties of English that are stigmatized. Clinton and Gingrich, for example, could both be characterized as having Southern accents. Thus, there appears to be a tendency toward politicians who use stigmatized varieties of English (including Black politicians) being described as articulate perhaps as a way of positively framing their speech in the face of negative attitudes toward their speech patterns. Thomas Murray, a precise, articulate college professor, bludgeoned his former wife to death in the living room of her home. The characteristics used to describe Murray including his apparent articulateness appear to be intended as contrasting information to what is revealed later in the sentence, that he is the perpetrator of a violent crime. Murray it seems, is not what we are supposed to assume a man who would beat his ex-wife to death should sound like. Is articulate used as a compliment? I’ve seen many people responding to African-Americans’ complaints about articulate suggesting that it is intended as a compliment and thus shouldn’t cause offense. Looking over the data, I’ve collected, however, I find this claim to be quite suspect. To begin with, there are in fact instances where articulate is pretty clearly intended as a compliment. The following example from a letter to the editor praising Newt Gingrich seems to show the phrase used in an unambiguously positive fashion. He [Newt Gingrich] was selected because he works harder, is better informed and more articulate than virtually anyone else in Congress – Democrat or Republican. One of the more ominous outcomes of the U.N. climate talks in Copenhagen is further evidence that the president [Barack Obama] many of us rallied around for “change we can believe in ” is truly nothing more than a more articulate spokesman for business as usual. In line with the way African-Americans report that the word is used to describe them, the word also seems to come forth when writers and speakers are ostensibly trying to combat what they perceive as audience’s preconceived notions as in these examples. It takes two to form a power couple, and Microsoft billionaire Bill Gates’ wife Melinda, 39, is no trophy wife: She’s a potent force in their huge philanthropic efforts. A former Microsoft manager, she’s focused since 1996 on funding such efforts as fighting AIDS in Africa, improving reproductive health care in the developing world, bringing computers and Internet access to low-income communities, and upgrading public high schools in the United States. But she’s more than just a check signer for the Bill and Melinda Gates Foundation, she’s an articulate voice for the needs-and potential-of those less fortunate than herself. But [General Calvin] Waller, a capable, articulate Army officer who happens to be black, was not expected to lose his job for stating a rival case: that the war can be won on the ground, but only when the Army is ready to win it. The function of articulate in these examples is complex. Even if we assume that the writers and speakers intend to compliment these individuals by discussing their articulateness, the compliment seems somehow less than complimentary. Indeed, in all three cases, there is an indication that the need to describe the person as articulate stems from widespread assumptions that they would not be articulate. In this sense then, rather than being a compliment, articulate seems to function as mere confirmation that the individual is capable of some level of expression. We might assume the person possesses this expressive ability (correctly or incorrectly) based on other information like their advanced education, their extensive involvement in philanthropic work, or their career success, if we were not being biased by social stereotypes. To the extent that such confirmation is necessary to combat prejudice, these writers and speakers might be viewed as having perfectly good intentions. Nonetheless, the fact that they feel compelled to make these comments is definitely a sign that we are biased in how we view people’s abilities to express themselves. Lending some more support to past writers’ claims about articulate, I detected a racial bias in the media’s use of the term for public figures. Specifically POC in my sample were described as articulate at a disproportionately higher rate than their White counterparts. This appears to be connected to a more general use of the word to express surprise at the ability of someone to express themselves because of some type of negative stereotype, racial or otherwise. The word can indeed be used in a complimentary fashion especially when writers and speakers make it absolutely clear that the level of articulateness is exceptional no matter who we compare the person to. However, this usage is infrequent at least in its explicit form, and there is a great deal of ambiguity in how most instances are intended. The term can often be interpreted in the sense described by Ana Perez to mean “articulate… for a black person”, to which we might add “…for a woman”, “…for a member of the lower class”, “…for someone convicted of a crime”, and so on. In addition, the word is also often used to express the idea that someone has style but lacks substance. Such usage greatly undercuts the degree to which articulate can be said to be complimentary and suggests that the offense people take to the word is quite legitimate.